The recent phosphorus crisis threatens human endeavor on planet Earth. Being an essential building block of all life forms, phosphorus fertilization is necessary to sustain food production. On the one hand, phosphorus-rich mines are a limited resource. On the other hand, losses to our rivers and oceans lead to eutrophication, i.e. 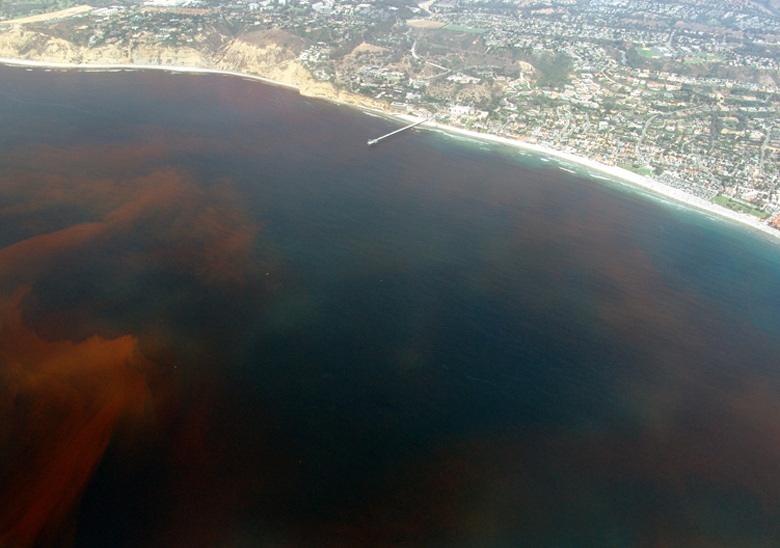 toxic algae blooms. In 2008, a reconstruction of the global phosphorus losses to the oceans led to the prediction that by the year 3600 all phosphorus reserves would be depleted.1 By that time, humans will have gone extinct or will have found new ways to recycle phosphorus. Figure 1. Schematic overview of the mechanisms that control phosphate (PO4) leaching in agricultural soil. Particulate iron (Fe) and aluminum (Al) oxyhydroxides can bind PO4 and prevent it from leaching. Mobile, nano-sized Fe, and Al oxyhydroxides bind PO4 as well and enhance leaching of phosphorus. Figure republished with permission from Elsevier from https://doi.org/10.1016/j.apgeochem.2018.12.012. In Europe, plants have only taken up about 30% of the P applied to arable land as fertiliser (1 115 kg P ha-1) during the period between 1965-2007.2 This resulted in a huge pool of “legacy phosphorus” in arable soils: a ticking time bomb for eutrophication that slowly leaks to the aquatic environment.3 The rate of that leakage is yet unknown. Especially the vertical leaching of phosphorus may only reach groundwater after centuries in most well-drained soils, according to predictions of traditional models. However, subsurface enrichment of P and significant phosphorus losses in drainage water are often reported. Thus, there is a large need for models being able to explain this fast, enigmatic vertical migration of phosphorus in soil. We set out to elucidate the mechanisms of vertical phosphorus migration in agricultural soil through analysis of data from column experiments and through geochemical modeling. Before I started my Ph.D., Thijs Vanden Nest and Fien Amery, former researchers from our group, conducted leaching experiments with 120 columns. Artificial rainwater was applied at the top of the columns, filled with agricultural soil, and a vacuum pump at the bottom mimicked unsaturated field conditions. The water that leached from the bottom of the columns was analyzed, leading to 962 leachate samples. My task was to pool and analyze the data and to evaluate the use of surface complexation models to describe phosphorus leaching from these columns. The horizontal red line indicates the environmental limit for total P concentration in Flemish surface water. Most leachate samples exceed this limit by several orders of magnitude. This showed us that sorption of phosphate on iron and aluminum oxyhydroxides likely controls the concentration of phosphorus in the leachates. The phosphorus concentrations and the KD’s are shown on logarithmic scales. Figure republished with permission from Elsevier from https://doi.org/10.1016/j.apgeochem.2018.12.012. Both strong correlations suggested that phosphate sorption on iron and aluminum controlled P leaching. However, our surface complexation modeling efforts, i.e. a detailed mathematical description of this sorption process, did not yield a satisfactory description: in only a few cases did the predicted phosphorus concentration match the observed one. Nanoparticles facilitate vertical phosphorus transport: free shipping! Then, something happened that we did not expect: nanoparticles were present! First, we noticed relatively large concentrations of Fe and Al in the 450-nm-filtered leachate samples. Moreover, the concentrations of both elements were extremely positively correlated (Figure 3). Both Fe and Al cannot be present as ions, i.e. being “truly dissolved.” If so, chemical theory predicts they would readily precipitate as iron and aluminum oxyhydroxide minerals. That is exactly what explains the strong correlation between both. Most likely, both Fe and Al in the leachates were present as nanoparticles and were linked to each other in the same colloid-sized particles (i.e. large nanoparticles: 1 – 450 nm), as is commonly observed for natural waters. Nanoparticles are present, but so what? Figure 3. 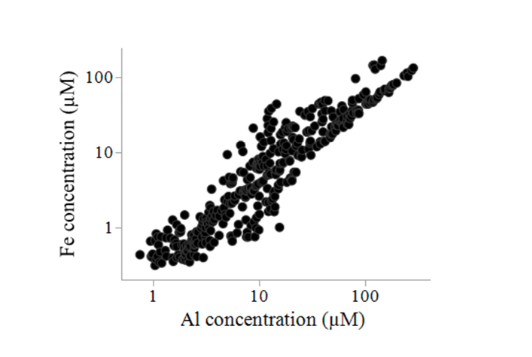 The concentration of Fe and Al in filtered (450 nm pore size membranes) leachate samples are strongly positively correlated. Figure republished with permission from Elsevier from https://doi.org/10.1016/j.apgeochem.2018.12.012. The main feature of a nanoparticle is its extremely large specific surface area (i.e. the area-to-mass ratio). A cube with a side length of 1 cm has a surface area of 6 cm2. If you cut the cube in eight identical smaller cubes, the mass does not change, but the surface area doubles. Repeating this 17 times will bring you in the nano range: cubes will have a length of about 80 nm and yield a total surface area of about 800,000 cm2. It is well known that natural iron oxyhydroxides can have a specific surface area of up to 600 m2 per gram! All this surface can bind ions, like phosphate. Imagine a transport company that can transport 800,000 times more packages than the competitors on the market, would you go for nano? 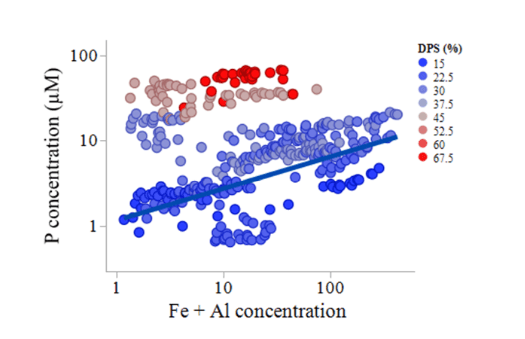 For the soils with a degree of phosphate saturation below 30%, the leachate concentration of phosphorus increases with increasing concentrations of Fe and Al (blue points, Figure 4). Thus, increasing the concentrations of nanoparticles in the soil’s liquid phase increases the leachate phosphorus concentrations, but only for the low-saturated soils. Figure 4. The P concentration in the leachates increases with increasing Fe and Al concentrations, but only for the low-saturated soils (degree of phosphate saturation below 30%). This suggests colloidal mediated phosphorus transport. Figure republished with permission from Elsevier from https://doi.org/10.1016/j.apgeochem.2018.12.012. These results suggest that natural nanoparticles, that contain Fe and Al, can bind and transport phosphorus in agricultural soil, elevating phosphorus leaching and thus eutrophication. But can this be described mathematically? And would the model suggest the same? Indeed, we simply incorporated the nanoparticles as a third phase (solid particulate phase, liquid phase and solid nano-particulate phase) in the model. Phosphorus was then divided over the three phases by the laws of chemical equilibria. Suddenly, the accuracy of our predictions doubled! Moreover, the model predicted that nanoparticles can enhance leachate phosphorus concentrations up to a factor 50, but only for the low-saturated soils. In soils saturated with phosphorus, even the surface of nanoparticles saturates. As a consequence, their affinity for phosphorus drops. A postman overloaded with packages will drop them and fail to deliver! This thus explained Figure 3. To conclude, we found that phosphate sorption on iron and aluminum oxyhydroxides in soil controls leachate phosphorus concentrations. The iron and aluminum oxyhydroxides in the particulate phase are immobile and binding of phosphate impedes its migration. However, these oxyhydroxides can have nano-sized dimensions and be present in the soil solution. Mobile nanoparticles bind phosphate as well and thus enhance phosphorus migration and eutrophication. Our surface complexation model was a powerful tool to understand the nano-particulate transport of phosphorus in soil. However, a lot is yet to be discovered on the mechanisms that control the amount, size, and mobility of nanoparticles in soil. These findings are described in the article entitled Investigation on the control of phosphate leaching by sorption and colloidal transport: Column studies and multi-surface complexation modelling, recently published in the journal Applied Geochemistry. Filippelli, G. M. The Global Phosphorus Cycle: Past, Present, and Future. Elements 2008. Sattari, S. Z.; Bouwman, A. F.; Giller, K. E.; van Ittersum, M. K. Residual Soil Phosphorus as the Missing Piece in the Global Phosphorus Crisis Puzzle. Proc. Natl. Acad. Sci. 2012, 109 (16), 6348–6353. Jarvie, H. P.; Sharpley, A. N.; Spears, B.; Buda, A. R.; May, L.; Kleinman, P. J. A. Water Quality Remediation Faces Unprecedented Challenges from “Legacy Phosphorus.” Environ. Sci. Technol. 2013, 47 (16), 8997–8998. Ruben Warrinnier is a Ph.D. student in the Division of Soil and Water Management (Department of Earth and Environmental Sciences, KU Leuven). His research focuses on the fate of phosphorus (P) in agricultural soil after application as fertilizer. Previous Post« Previous Will A “Grand Convergence In Global Health” Happen By 2035?